Welcome back. You may recall in my blog post Cat Bites, I mentioned that Vicki has taken full responsibility for the care of her two “barn” cats that reside in our garage, including calling or whistling them in for the night. If Vicki’s working outside in the late afternoon and they see her walking home, they’ll follow her with minimal signaling on her part. They troop behind her like puppies trying to keep up, diverted by just about anything. One evening, a bit later and darker than usual, the cats were following her up the middle of the driveway. Vicki turned to check on their progress, especially Mandy’s. Though sisters, Mindy is all for being home at night, but Mandy’s a night owl, who can find more exciting places to be. Mandy was coming, though definitely trailing. Vicki waited a few seconds, then started to encourage her when…Whoa! That’s not Mandy! At the precise moment that Vicki realized the Mandy following her was not Mandy but an opossum, the opossum following Vicki home realized that it shouldn’t be following Vicki. Neither Mindy nor the real Mandy paid much attention as the opossum scooted off into the darkness. When Vicki relayed the episode to me, it confirmed that the animal I’d twice witnessed when I was beginning my daily predawn jog-walk was indeed an opossum. Having no familiarity with opossums, I had reservations, thinking they didn’t move as fast as the animal I’d observed. It also convinced me that I had to learn more about opossums. There’s a wealth of information available online, though the sources don’t always agree on the details. I’ll hit the highlights and provide several websites if you’re interested in more (see P.S.). Feel free to comment should corrections be needed. First, let’s get the name straight. In the U.S. we have opossums; they range from South America to North America. We do not have possums, which are native to Australia and New Guinea. 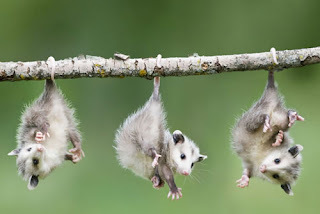 Opossums and possums are both marsupials--mammals, like kangaroos, which are born undeveloped and typically carried and suckled in a pouch on the mother's belly. But they’re different animals. Opossums are in the taxonomic family Didelphidae; possums are in the family Phalangeridae. 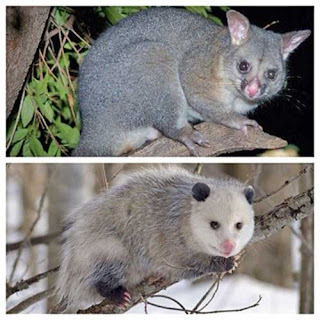 While Australia can boast of a variety of marsupials, we’ve got only one, the opossum. 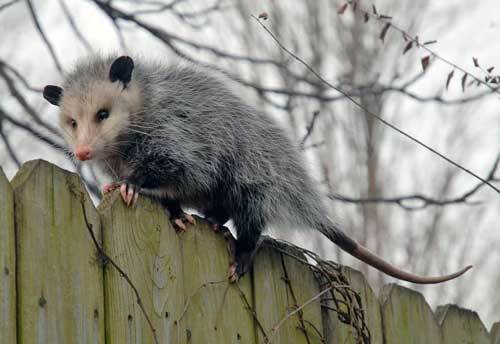 The most common species of opossum in the U.S. is the “Virginia opossum” (Didelphis virginiana). Adults are generally 2 to 3 feet long, counting a hairless tail that’s at least one-third of the total length if not lost to frostbite. They weigh 4 to 15 pounds, have four paws, grey fur with a white face, a long, pointed snout, round dark eyes (mostly dilated pupils) and hairless ears, the tips of which might also be removed by frostbite. They may live 7 years, though most survive less than 2, succumbing to predators (e.g., raptors, fox) and motor vehicles. Although opossums normally walk slowly, tail swinging, they reportedly can run 4 to 7 miles/hour. 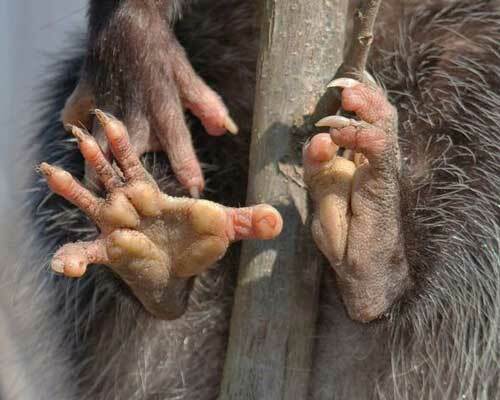 Aided by the grasping capability of their opposable hindfeet toes and prehensile tails, they’re able to climb trees to seek food or safety and may hang by their tails, freeing their feet for handling food. That said, some may never leave the ground. They’re also able to swim well at the surface or underwater. Being solitary and nomadic, opossums occupy abandoned burrows or dens or spaces in structures, usually staying in one area only as long as food and water are available. They are most active at night, particularly in spring and summer, and not well adapted to cold. If colder weather reduces the food supply when their need for caloric intake increases, they may become active during the day. Coincidentally, I gathered that last bit of information one early afternoon a couple of weeks after Vicki’s encounter. I was sitting at my desktop computer and happened to look out our second-story apartment window at the leafless trees and brush and snow-covered ground. About 100 feet away, an opossum was walking by, and Mindy wasn’t far behind. I’m sorry. I’m afraid this blog post is already too long, and I’ve a lot more to add. Suppose I stop now and pick it up in the next post, where I’ll add the P.S. I hope you’ll be back.